These openers make wonderful Groomsman (and other!) gifts. Package offers are available for purchases of 3+ openers. Contact us to arrange details. 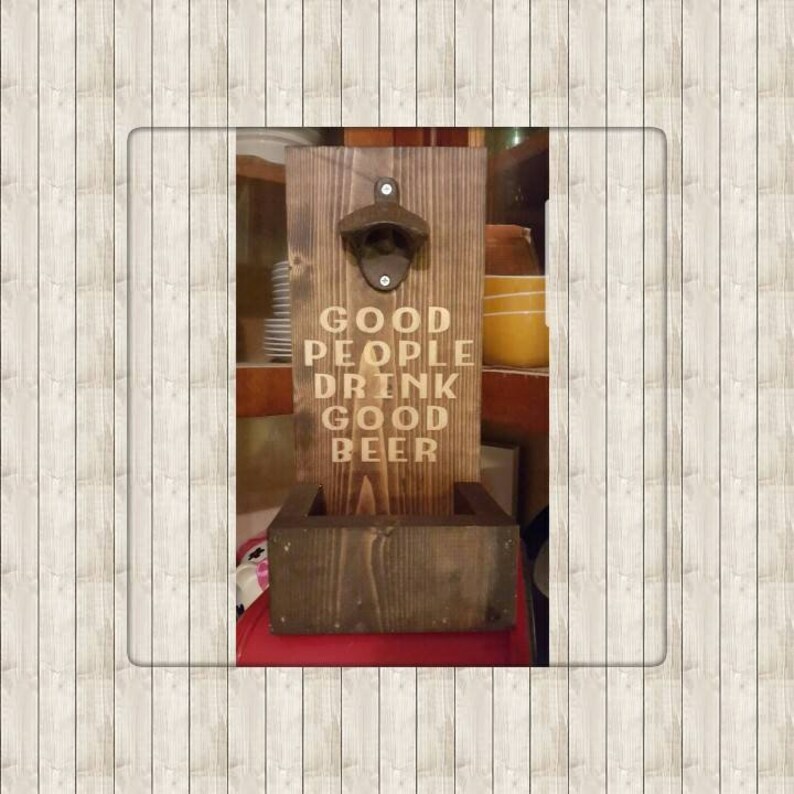 Constructed from solid wood, this beer opener sign measures 14 inches tall, 5.5 inches wide and cap catcher portion measures 2 inches deep. 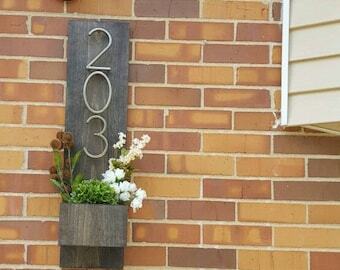 Sign is stained brown and comes with a pre-mounted bottle opener and includes a sawtooth hanger. Great quality, fast shipping, great service!!! I needed this FAST and she got it to me immediately!! My friend LOVED it! Custom and Personalized orders are not only welcomed, they are encouraged! I would love the opportunity to work with you on your special piece! Custom Invoices will expire 48 hours after creation. No Refunds/Exchanges will be accepted for Custom Orders. Before purchasing your custom order, you are provided an invoice with a break down detailing dimensions, color(s), hardware, shipping and any additional add-ons. Discrepancies should be reported prior to purchasing your Custom Invoice. Custom Beer Openers are a great gift to give to your Groomsmen/Bridesmaids! Discounted rates are available on packages of 5+ openers. Your custom set of openers will come with a simple bow tied in the color of your choice (I will gladly match your wedding colors!) and tag for gifting. Three combined attempts will be made to contact you via the Etsy message inbox and the email address registered with your Etsy account profile. -text will read, "look what I made!" You will be notified of this as well in your package and you will have the opportunity to ship the piece(s) back to me for personalization. Shipping times vary per each item available in my shop. These details can be found in the 'Shipping & Policies' tab in each listing. If a shipping time reflects 3-5 business days, you should safely assume that your order will ship on/no later than the 5th day. Do you need your order quicker? Please contact me BEFORE placing your order to confirm that your order can be completed in the time frame you require. Pushing your order to the top of the list requires purchase of the 'Rush My Order' listing in my shop. Changes to your order (stain choice, text change, number color, layout) are permitted to your order within the first 24 hours after submitting your order; after that window, work has begun on your order. EVERY piece in my shop is made to order. This means that the supply costs for your order are built into the pricing. If you decide that you would like to change any detail of your order after the 24 hour window, you will be responsible for any additional costs for the supplies to make the changes. 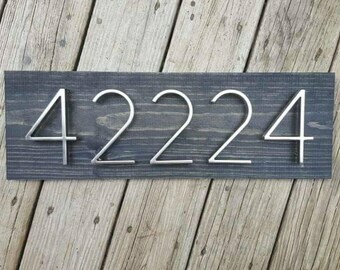 Do you offer Letters for address pieces? I am not able to keep letters on hand BUT I have access to them. They are made from heavy duty, marine grade, weather resistant, fade proof, crack proof plastic. They are floating. Message me for those details. Do you want to match the preexisting stain or paint on your home with your purchase? You can order any piece in my shop unfinished (no stain). Message me directly to discuss those details. You may cancel your order within 24 hours of purchase. After the 24 hour window a 15% cancellation fee will then apply. Please read processing and item details carefully prior to ordering to avoid cancellation. Please direct all communications to me via the Etsy inbox. In order to protect myself (and you!) all questions about orders must be made through the Etsy inbox for record keeping purposes. Any correspondence received through email will be directed to contact me through Etsy. Thank you!